I love surprises ... and lookie! 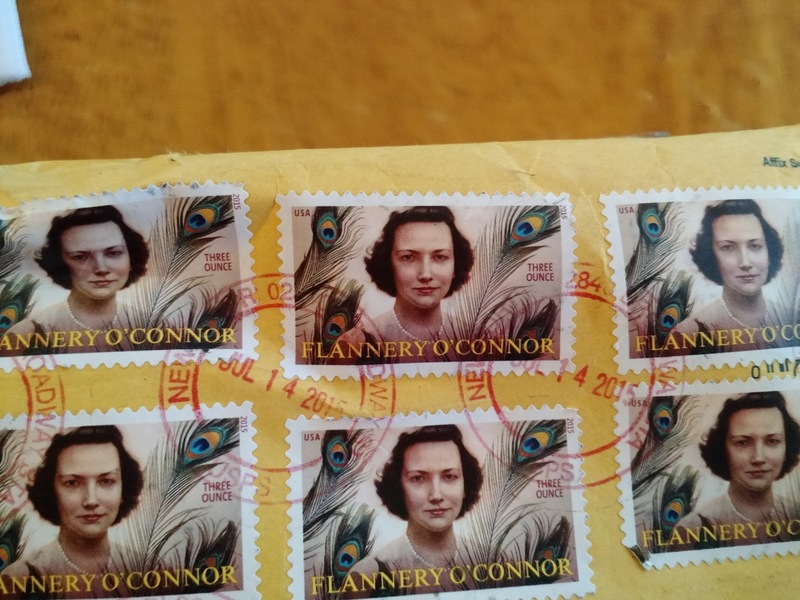 The new Flannery stamps!!! Quick, take a picture, I told my son, before I ripped the package open. There was a book on prayer and a beautiful notecard with St. Paul of the Cross with this quote: We ought to glory in nothing other than the cross of our Lord Jesus Christ. You are blessed and don't know it. You have Jesus Crucified with you. How these words inflame my own heart to suffer well. And then there was another well-packed thing to open. I certainly did not expect Flannery framed. 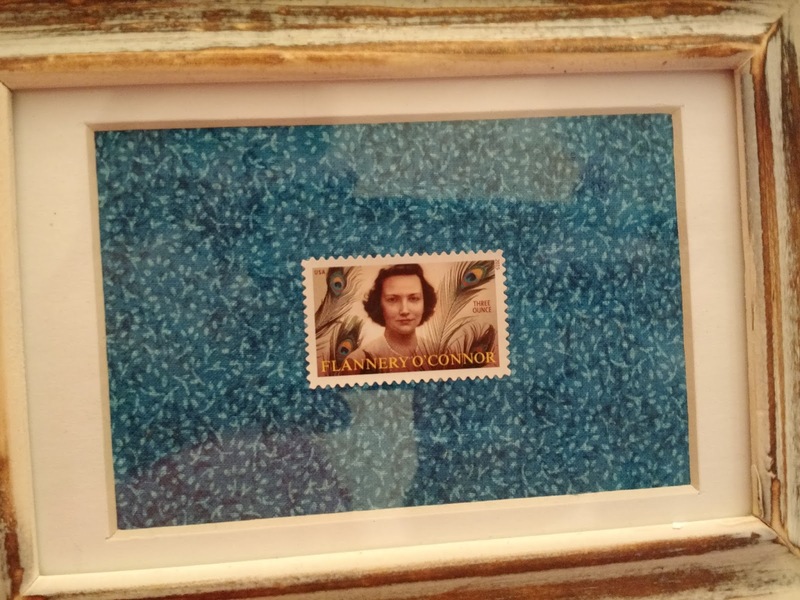 She's on my desk, and I love that she might be looking down at me and praying for me. Thank you, my friend, for such a beautiful gift! I've read several of her books, both fiction and nonfiction. Her letters are a wonder. She is funny and gracious and full of wisdom. I don't think I will ever tire of re-reading her stories. They are electric. But the one book I return to most often is MYSTERY AND MANNERS, a must for writers. 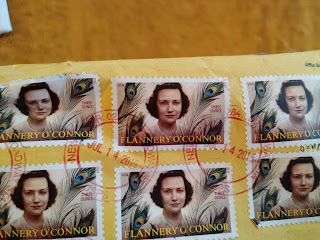 And lookie what else I found online: If Flannery had a blog! Check it out. It has quotations, essays, and even advice on where to begin with if you are interested in reading Flannery. This is another book that is causing a book fight in our home. 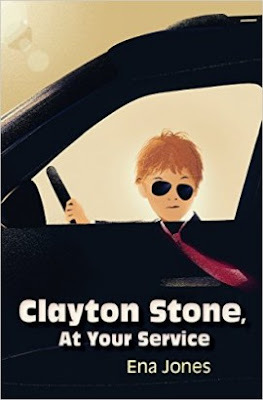 Ena Jones' debut MG novel, Clayton Stone, At Your Service, is rollicking good fun. I loved the premise of a regular kid discovering that his grandmother is a spy and more, and then getting in on the action. And boy does he get serious action and the best part it is that he drives much of it -- he takes the necessary risks to save people from the bad guys. I also loved that he was just as concerned about letting down his lacrosse team. He misses his parents. He is very human -- a 3-dimensional character. Best of all, the adventure has just begun. There's a second Clayton book that Mrs. Jones is revising :) No, I haven't seen it, and even I did, I wouldn't spill any secrets. Our family had planned a trip to VA, but a nasty migraine kept me at home. I missed everybody so very much, but was especially disappointed that I couldn't attend the conference held at Christendom College. My kids didn't take notes, but my husband did and it's been lovely to hear about it from them. Check out this summary. And here's an iTunes link if you want to listen to any of the talks. I am praying to be healed. I've been in near constant pain since April. How I wish I could do more instead of lie in bed and pray. Although we like to live by the rule of St. Benedict: ora et labora, sometimes I have to remind myself what St. John Bosco said, ora est labora. It is so easy to forget that your worth does not lie in what you can do but just in the fact that you are precious to God just as you are. I was especially heartened to read this reflection on Moses' life by Msgr. Charles Pope. Here are some beautiful photos of the Shenandoah valley and Busch Gardens. But I'm happy to have everybody at home. We've been reading a lot of books and luckily there are enough new books that there are no book fights. However, there were a couple of skirmishes over who would get to read these first. I'm happy to say I got the privilege. I promptly took the package to my bedroom and closed the door. Hey, all is fair in love and war and books. 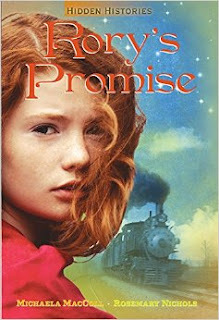 I had hoped and hoped to win this after reading about it on Carol's excellent blog and I did :) RORY'S PROMISE by Michaela MacColl and Rosemary Nichols is one of those rare books that are so thoroughly researched, the details bring the book to life. This is no ordinary Orphan Train book, but investigates a slice of history that not many people know about, when Mexican women fought to adopt white children. It made me realize how important it is preserve religious heritage when thinking about adoptions. The color of your skin matters far less. It also made me realize how important it is to get the facts right when writing historical fiction. Isn't that the point? To make history come alive. Increasingly though, I find that people want to rewrite history through a modern lens. Granted that there were people in olden times who did not fit during their times, but it is dangerous to put modern sensibilities upon them or to twist the truth. So I especially appreciate a book like Rory's Promise and an editor like Carolyn Yoder, who push you to dig deeper to reveal truth. I really enjoyed this autobiography, this journey of faith. 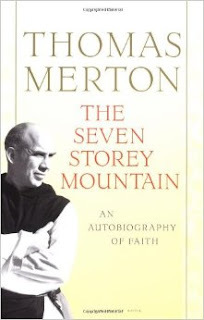 How beautifully he writes of his childhood and of the unsung saints who might be the reason he ended up a monk. I laughed and cried while reading this book, marking passages of sheer beauty. He is a poet at heart. I highly recommend this to anybody who is curious about how a worldly person gives it all up to become a monk. It reminds me of St. Augustine's Confessions, only it is much more accessible because of the modern language. My kids rode their bikes out to get pictures of the fireworks in Charleston. I was wiped out, so stayed home. It is really nice having older kids and I especially enjoyed this article by Fr. Dwight Longnecker about freedom and responsibility -- it's something we have to discuss from time to time with our kids, especially when they lapse in the responsibility dept. Enjoy Max's pictures. I hope everybody is having a wonderful holiday weekend. Wishing you all a safe and happy Independence Day. Here are some quotes to reflect upon life, liberty and the pursuit of happiness compiled by John Clark. As I was singing America the Beautiful, I couldn't help but think what a beautiful prayer for our country. In these dark times where evil is pronounced as good from the highest court, this false freedom that enslaves us, of lawlessness really, I was struck by these lines: America! America! God mend thine every flaw, Confirm thy soul in self-control, Thy liberty in law! Enjoy these beautiful photos Max took last night.